DC at work: Rick Smith will be asked to piece together another secondary unit. 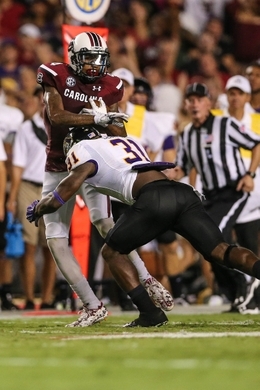 Back drop: Turning to the final position group discussion for this way-too-early look at the ECU roster for 2015-16, it is time to look at the secondary. Defensive Coordinator Rick Smith’s passion may very well be the secondary, where he has spent much of his tenure developing schemes and players. Coming from the DC perspective, he has been charged with trying to figure out how to stop offenses that are powerful through the air and this could be the reason that despite losing multiple starters each year out, he somehow finds a way to put together a viable if not very good secondary. He has had his hand in recruiting the types of players he needs to ensure that the secondary becomes a strength in an ever-improving overall defensive unit. Last season, while the Pirates allowed more than 3,300 yards in passing offense, the Pirates finished a respectable 37th in the nation in pass efficiency defense in a season where there were similar pre-season questions about the secondary as they face going into this pre-season. As a group, the Pirates are fortunate to return a veteran corner and a veteran safety, but like the last two seasons, again find themselves searching for a starter-ready corner and safety and, of course, depth – quality depth – will have to be identified. Between Field Corner Josh Hawkins and free safety Domonique Lennon (if he has addressed the academic issues that kept him out of the Birmingham Bowl), the Pirates have solid experience to help bring along the newbies in the secondary. The half-empty view, however, says that the secondary will only be as good as these two newbies are and getting them to starter-ready will be Smith’s challenge. There is some experienced depth to be leveraged…guys like Rocco Scarfone and DaShaun Amos, should either fail to win a starting job outright, so the coffers are not empty. Let’s take a closer look at the Pirates who will be battling for spots on the DC in the secondary. 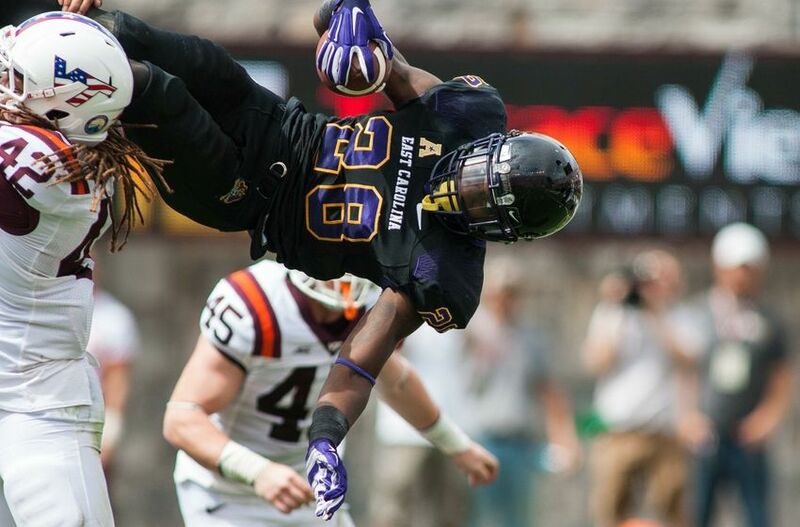 The Playmaker: Hawkins is the face of the Pirates’ secondary, making plays like this acrobatic pick vs Virginia Tech. Josh Hawkins (RS-SR) – Field Corner: Hawkins represents the ECU secondary’s most experienced player and will be called upon to also be a leader for the group. He has worked himself into an all-AAC type of player, should he continue to develop as he has since coming into the line-up. He has accumulated 15 starts in his two years seeing the field and served notice in 2015 that he is a playmaker, swiping 5 INTs on the season. He has developed an ability to cover the bigger receivers the Pirates face despite being 5-10 and he supports the run defense extremely well, again playing much bigger than he actually is having racked up 84 tackles in his two seasons on the field. And, his experience isn’t just in numbers of games, but also in the fact that he has faced some highly-talented receivers, proving that he can play corner with the best of them. Experienced enforcer: Lennon lowers the boom. Terrell Richardson (RS-JR) – Strong Safety: Richardson is another overlooked walk-on who was a miss by recruitniks. He knows what Rick Smith is trying to do in the secondary at the Strong Safety position and pushed 2014 starter Lamar Ivey hard throughout the season before eventually winning the starting job for the final two games of the season. He is a physical player at 6-0, 210 pounds and as a back-up for most of the season, still managed to pile up 20 tackles between regular play and special teams worki. Smith, in a recent interview indicated that Richardson was the better strong safety by season’s end which means he should carry momentum into the spring to lock the top job down. Domonique Lennon (RS-SR) – Free Safety: Notwithstanding any doghouse issues that may haunt him after being ruled ineligible for the Birmingham Bowl, assuming that he will/has resolved those issues, Lennon is certainly the favorite to maintain his hold on the FS position. Having taken to the mentoring provided him by former Pirates stud Damon Magazu during his tenure as the Pirates FS, Lennon and his 6-2 frame showed in 2014 that he can be a very good safety for the Pirates. Perhaps even an all-AAC type for the D. He finished 4th on the team in tackles a year ago with 65, demonstrating that he get up in there to support the run and he showed he could do well in coverage (2 pass break-ups, 2 pass deflections). He is physical and he now boasts the experience that comes with 12 starts a year ago. Barring any off-field issues, Lennon should be the guy heading into his final campaign. Patience paying off? Benton has been chomping at the bit to start. DaShawn Benton (JR) Boundary Corner: The 6-0, 189 pounder has been a stalwart special teamer and back-up in the secondary since earning playing time as a true freshman. He is a passionate player who is fearless in the world of isolated, one-on-one football. While he had 14 tackles last season, perhaps his greatest gain a year ago came from backing up 13-game starter Detric Allen and having to prepare for his number being called each week as primary back-up. Up to now, Benton has show spectacular flashes of physicality on the line of scrimmage, ability to play close cover, and for being a punisher in coverage. Of the four projected starters here, he has the most to prove to get one of the jobs, but his upside is super high. Repetitions are what will help him over the top. Famous Amos? Could be…he has the talent to knock off a starter. DaShaun Amos (RS-JR) Field Corner: Amos, a 6-1 182 pounder saw the field in all 13 games a year ago and even drew a start at the field corner position. An athletic and physical corner, he has a great toolset to be a starter-in-wait behind the top DB in the unit in Hawkins. Amos piled up 18 tackles (2 TFLs) to go with a sack last season and will be hungry to have more PT in 2015-16. Another quality depth guy at a critical position for the Pirates. If Amos comes out and challenges Hawkins for the job this year, it is a strong sign that the Pirates are lock-down ready at the FC position. Bobby Fulp (SO) Strong Safety: Who is Bobby Fulp you ask? Good question. A walk-on who found his way onto the field last season in 12 games (3 tackles). I asked myself that question too, but some research revealed that Fulp’s upside is tremendous. He is a 6-4, 195 pounder with long arms and a physical style. He also has great agility and hands, having been a standout punt returner in high school (Clover Hill HS, Va.). A rangy safety could be a boon for the Pirates who have had a penchant for giving up the over the top long ball too often. He is raw, but has been a favorite of Smith’s since he walked into the program two years ago. Travon Simmons (RS-SO) Free Safety: So, there you are, a RS-FR being told the week of the Birmingham Bowl that you are going to have to start the game in place of ineligible starter Domonique Lennon. A lot of young players would have crumbled. 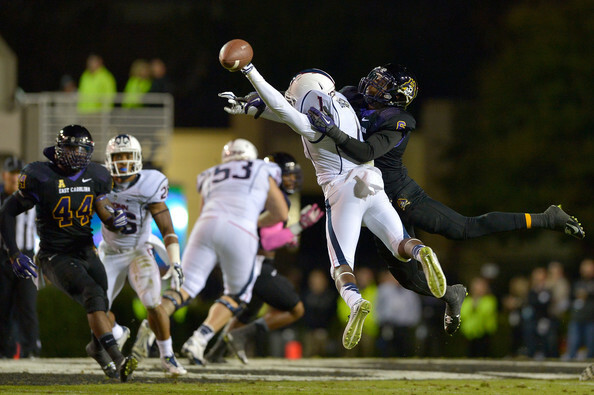 But Simmons, instead, embraced the challenge and finished the game with 3 tackles and a forced fumble. Getting that experience, to go along with action in 8 other games (7 tackles, an INT, 2 PBUs, and 3 PDs) gave Simmons a healthy taste of what life could be like as a full-time player. He will be the odds on favorite to grab the top reserve role (read: No. 2 on the DC) at FS for the Pirates in 2015-16. Experienced and ready: Scarfone will up the ante this spring. Rocco Scarfone (RS-SR) Boundary Corner: Perhaps a great move by DC Smith was to designate Scarfone the starter at field corner for the Birmingham Bowl. Here is a player who has been quietly gathering experience as a back-up and learning the system, while Hawkins has garnered the pub. He played in all 13 games a year ago and finished with 11 tackles. More importantly, with his last year upon him and a taste of the starter’s life. With a skillset that translates well to a switch to the Boundary side, Scarfone could make it a real battle for the starting job against a talented, but no more experienced Benton, Benton may end up the guy, but with Scarfone, there will be a back-up with starter qualities and plenty of on-field experience. Cody Purdie (SO): The 5-11, 189 pounder will have a say in how the 2-deep looks in 2015-16 as he enters spring looking to battle at one of the safety positions – most likely at Strong Safety. Last season, he contributed a pair of tackles in the four games he saw action in, but has been spoken highly of by the staff after a good true frosh season. Purdie is a competitor which should come as no surprise considering he is a former New Bern HS product, which has long been a fruitful pipeline for the Pirates. Looking up at the DC is perfect for a player like Purdie who will no doubt bring it this spring and fall. Chris Love (RS-SO): With a crowded backfield full of talent, Love graciously accepted the challenge to move to the defensive side of the ball and that move may prove to be a very beneficial one for the Pirates and Love as well. Love has speed and great hands and agility so it screams corner, corner, corner! With his skillset, Love could be poised to be a “surprise” this spring for the Pirates. 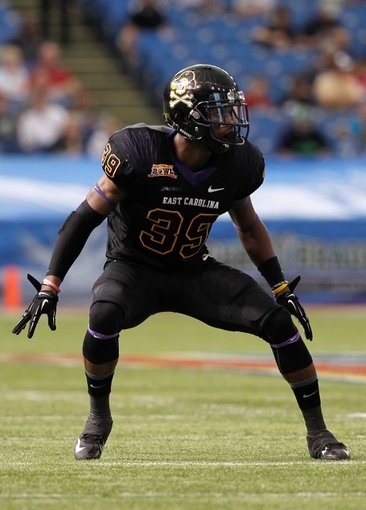 Xavier Smith (RS-SO): The 6-2 195 pounder came to ECU in 2013 as a 3-star prospect out of Raleigh. He earned his way onto the field last season to see action in 2 games. His size is what makes him a prospect for earning PT in 2015-16. With a desire to go bigger, Smith offers the Pirates the type of frame that can match up with today’s bigger receivers. Like other young players on the roster, he is raw and still trying to find a home position-wise, but has the size and with that size comes potential. While he played corner at Wakefield HS, his speed (4.6) may see him shift to safety. Travis Phillips (RS-SO): The 5-11, 180 pounder brings a 4.41 speed to the corner position and wide receiver hands. He was an multi-year all-district wide receiver in high school, so he should be able to dispel the notion that DBs play DB cause they can’t catch. He can catch, no doubt. Phillips was able to see action in a game this past season and should progress this spring and into the fall. With his wheels, you cannot rule him out for DC spot. Blake Norwood (RS-FR): At 6-0, 190 pounds, Norwood likely projects to a safety position for the Pirates. He originally committed in 2013, but went grayshirt route before joining team last season for a redshirt year. He was a strong enough prospect for the Pirates to grayshirt and should compete to get some notice in the spring and fall this year. He is a physical player whose strength numbers are fast-tracking up under Coach Jeff Connors. Early Call: The starters look to be pretty solid with Hawkins, Lennon, Richardson, and Benton and in guys like Scarfone and Amos, their is the makings of competitive depth in the coffers. It is the youngest of the roster guys that must emerge (at least 2-4 of them) to create a viable full 2-deep DC. For many of the young guys, they are simply names we know but games we have not yet come to witness. Coach Smith has his work cut out for him, but hasn’t he always? 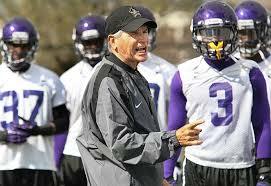 NEXT POST: Special teams have been a mixed bag for the Pirates during Coach Ruffin McNeil’s tenure. It looks to be the same heading into the 2015 season where the Pirates are uber strong in some places and have serious questions in others. 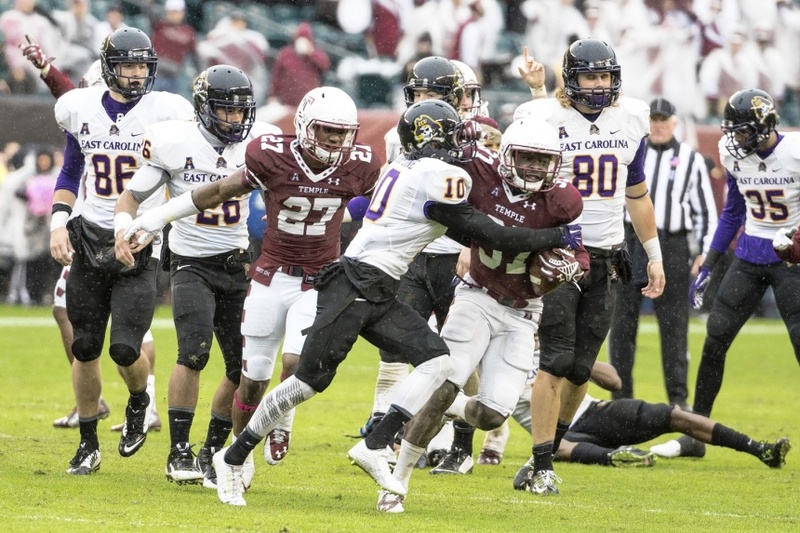 We’ll take a look at STs in the next and final post taking a way-too-early look at ECU football 2015-16. IMHO the DBs are the toughest players to evaluate because they are only as good as the pressure that is generated up front. Personally I am stunned we were ranked as high as what we were against the pass. Giving up the drive to Cincy was tough after they went out of their way to hand us the game. The UCF loss is one that I will never get over especially to that program. What happened in that game was totally inexcusable. We saw what should have been a special season get turned into a very average one with the talent that we put on the field against a schedule that featured many squads in rebuilding modes. With all of the athletic talent available across the country I cant understand why we can recruit scholarship level players in the secondary. I’m sure many in the Pirate chat sites are still waiting for Lucas Thompson to arrive ohh well. What this team has lacked over the years is a ball hawking hard hitting safety in the mold of Van Eskridge or Clint Harris ( sorry for the 25 year gap in reference) We need someone who can punish WRs that run across the middle of the field as well as fill on run plays. Basically we need more hard hitting, sure tackling players back in these positions but again they are only as good as the pass rush. As always, your insights are right on IMO. The two losses you circled there (as well as the Temple loss) uderscore in my mind, the fragile nature of the game in general. Coach Smith was standup enough to question his own thinking on the play that lost the UCF game rather than join in the clock-management discussion. He said he was asked to consider putting Cam Worthy or Bryce Williams or Justin Hardy back there and shook it off. He also admitted that he put Dayon Pratt in a bad position asking him to play deep coverage. I do not think we will see that mistake again. Totally, totally agree on the need for a Clint Harris type back there and you would think that we could find that guy somewhere…but it also takes a hard to find formula even if you are Alabama. You got to have a physically gifted player with size who also has a high football IQ…tough go for anyone let alone our program on a shoestring budget. I like Hawkins on the boundary side and think that Benton has the talent and demeanor to be a stud. But, safety is a concern, IMO and you nailed the gap. Maybe Lennon is that guy, but I don’t see a van Eskridge in the ranks right now. Hopefully one emerges. I owe you a call and will do so soon. Hope you are well!